Galician rabbi; died at Belz, a small town near Lemberg, Jan. 3 (or 23), 1632; buried in Lemberg. He was rabbi in Satanow and later in Belz, and, according to Lewinstein (in "'Ir Tehillah"), in Lemberg also. He wrote: "Torat Ḥayyim" (part i., Lublin, 1624; part ii., Cracow, 1636), novellæ on nine treatises of the Talmud; "Ẓon Ḳodashim" (Wandsbeck, 1729), notes on the Talmudic treatises of the order Ḳodashim, in collaboration with Mordecai Asher, rabbi of Brzezany; and "Ḳonṭres Bedeḳ ha-Bayit," notes on the part of the Shulḥan 'Aruk, Eben ha-'Ezer that deals with divorces ("hilkot giṭṭin"), printed with Judah Aryeh b. David's "Gur Aryeh" (Amsterdam, 1733). 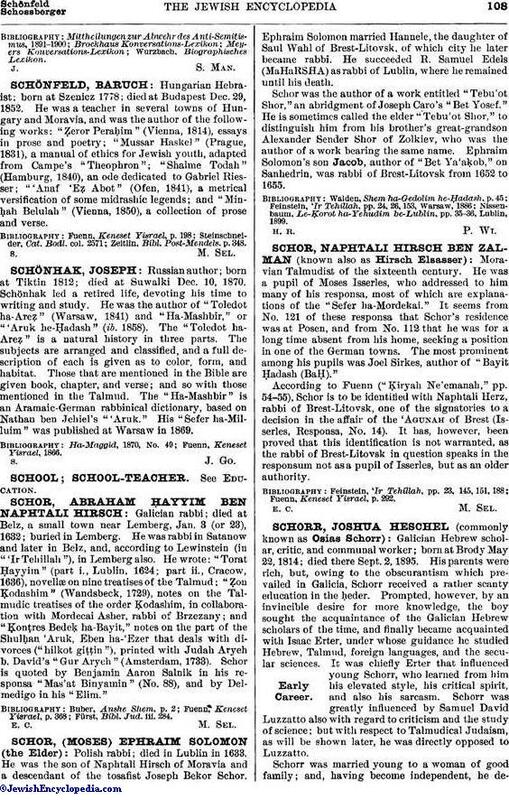 Schor is quoted by Benjamin Aaron Salnik in his responsa "Mas'at Binyamin" (No. 88), and by Delmedigo in his "Elim." Fürst, Bibl. Jud. iii. 284.